For decades, large capacity water tanks have been used to store water for drinking, farming, emergencies, and even manufacturing. In many areas, like in the Marcellus Shale gas country in PA, a substantial amount of water is recycled; there, they treat and reuse around 70%. But once the water is deemed suitable for use, it needs to be put into holding tanks that will ensure the water stays clean and safe. 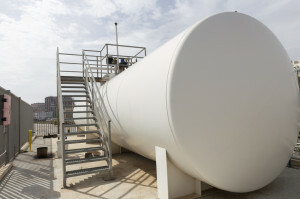 Although concrete holding tanks have been used for this purpose in the past, they are no longer the most suitable option. Stainless steel water tanks are actually a much better alternative to concrete. Below, we’ll take a closer look at the concrete vs steel water tanks debate and find out why stainless steel is the way to go for your water tank rental. Concrete tanks were historically considered to be an inexpensive choice for water storage. But an analysis conducted in Philadelphia found that stainless steel tanks cost substantially less than concrete ones to build and maintain. During a 45 to 50 year lifespan, concrete water tanks there cost more than a million dollars total, which translates to over $30,000 per year. In contrast, stainless steel water tanks used for around the same number of years cost a little over $300,000 total, or between $6,000 and $7,000 a year. Installation, repairs, and removal costs will be much higher with concrete vs steel water tanks, overall. Simply put, concrete tanks are prone to cracks. They tend to leak and are subject to corrosion, expansion, and contraction from changing temperatures and harsh weather. This can cause the water stored within to leak out. These damages can result in costly repairs and will essentially render the concrete tanks useless. Stainless steel tanks are resistant to corrosion and the freeze-thaw cycle, which means they’ll last for far longer. Concrete tanks are poured in place and are designed to remain in that spot forever. Unfortunately, this doesn’t always suit everyone’s needs. While the location for your operations may need to change, it’s impossible to move a concrete tank to a new spot. Stainless steel tanks, on the other hand, can be moved and placed with a forklift or transported to an entirely new location. As your needs change, your steel tank can go with you. This can eliminate the cost of procuring a new tank as well as stress and frustration. Concrete tanks certainly aren’t that nice to look at. They look dull and are often sullied with mold or graffiti. Stainless tanks look more streamlined and professional. They can even be painted to be a better match for the surroundings. It may never be mistaken for a beautiful art installation, but when you consider the aesthetic value of concrete vs steel water tanks, the answer is clear. Concrete tanks are susceptible to mold growth, chemical leakage, and bacteria. Because the material is porous, seepage is common. This can render the water unsafe for use. And while getting a concrete tank sealed can reduce the risk, it’s still not a perfect system. But because stainless steel tanks are non-porous, they provide no space for bacteria to grow or chemicals to leach through. You should never have to worry about the safety of the water being stored. If you run a sustainable business or simply want to make a sound ecological decision with your water storage, stainless steel tanks win out here, too. Steel can be recycled, which means that when you no longer need to use your storage tank, those materials can be reused to make other products. With concrete, there’s really not much you can do with those materials. Using stainless steel can allow you to benefit from a more reliable product while making an eco-friendly business decision. When it comes to the benefits of concrete vs steel water tanks, it’s clear that stainless steel comes out on top. When you need custom water tanks to ensure safety, flexibility, and sustainability, ModuTank is here to help. To find out more, contact us today.